In addition to being a physician, I am also a scientist. Someone who likes to understand how things work and loves doing experiments to ask (and answer) these questions. In this session, I am going to dive into Envision Kindness’ own research, which focuses on defining how images of kindness affect people. Short answer? These images potently inspire large increases in joy, hope, love, gratitude, and compassion, much more than even pretty pictures like puppies in a basket or a beautiful landscape. My aim for this lesson? To convince you, the reader, to rebalance your visual diet and include kindness pics in it. Your sense of joy and connection could change markedly. I’ve been doing experiments for as long as I can remember. When I was a kid (maybe 9 years old), I was taking clocks apart to see how they worked (my parents were less than thrilled when I couldn’t put them back together). Doing experiments allows for discovery—the pursuit of the truth. Because if we understand the truth, we can better make sense of, and benefit, our world. After Jesse (my son) and I set out on the road to build Envision Kindness, Jesse was a strong proponent of measuring the response to images of kindness. We already knew that after looking at pictures of kindness we (and other people) felt good–a warm, relaxed, and uplifted feeling. We also knew that other scientists–some described in SoK #2—had shown that a few minutes of a video about kindness caused significant changes in people, including how they felt and their willingness to volunteer. So we decided to measure the response not to a single video, but to several still photographs of acts of kindness and compare them to other types of images. If we understand the truth, we can better make sense of, and better our world. That’s why my son and I set out to measure the response to images of kindness. I have done a lot of research in people—although it has always been in human metabolism or physiology. Yet as this was in psychology, with the help of our scientific advisors, we designed a study to ask how people responded to a variety of types of images. The images we studied included “negative” images—those of violence, destruction, and neglect. “Neutral” images—hammers, towels, or doorknobs. “Positive” or pretty images—puppies in a basket, bunnies, flowers, etc. These three types or classes of images were from a standard set that psychologists have used for years. The last group was images of kindness. Examples of these included: a woman in distress on a dark stairwell being comforted by a police officer; a young man with a shaven head looking up from a sea of shaven heads. 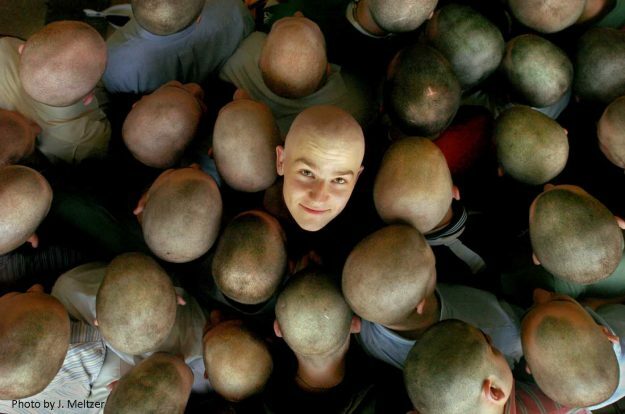 This young man was going for chemotherapy and his friends shaved their heads in support. That image, from Josh Meltzer (one of our photography advisors), is included in the blog. Before they saw any of the images, every one of the 400 participants completed questionnaires on how they were feeling. All were feeling pretty happy at the beginning of the study. Then each was assigned to look at images in one of the groups—so 100 people saw negative images, 100 neutral, etc. After seeing one type of image, they again completed the questionnaires on how they felt. The negative images did exactly what they had been shown to do before. People reported marked increases in sadness, fear, and anxiety and decreases in joy, optimism, gratitude, etc. It was really impressive how the negative images quickly and dramatically affected people. The “neutral” images didn’t do much of anything, which made sense. The “positive” or pretty images—the usual go to images for people who may be sad—like puppies in a basket—did make people feel more happy, more optimistic, or more grateful. Positive images increased their reports of feeling love or trust. These responses were consistent with what has been observed before (which is great). What was really interesting was that the 100 people who saw the images of kindness had about double the increase in joy (happiness), optimism, and gratitude that the 100 people who saw the positive images. Double the effect on self-reported love and trust. And a bunch of other emotions and states that were measured. I have looked at a lot of data in my scientific career. These results impressed me. Although not yet published in the peer-reviewed literature, they are consistent with (and expand upon) what had been observed by others. They said that there was something important in here, even more than what we originally thought. People who saw images of kindness had about double the increase in joy, optimism, and gratitude. The results really impressed me. Why would people respond to these kindness images more than pretty pictures? Particularly because the images weren’t pretty—each had a problem or challenge to meet and someone trying to help but not necessarily would be able to fix their problem. Maybe because these images touched on real life that people could relate to: they had emotion associated with them rather than just being cute or beautiful. Or maybe it is because at birth we are already “programmed” or “equipped” to recognize these scenes and respond to them. Or some combination. I welcome suggestions from our readers. Altogether, the results suggest that images like these can help people a lot. As part of Envision’s work, we are using the images from our large portfolio and combining them into unique presentations to amplify the responses further. Our goal: to inspire people as much as we can by stirring the inborn quality of kindness and compassion. This, in turn, allows for connection to one another (and ourselves) through our shared humanity. When people feel connected to others, joy, love, optimism, and compassion flow much more naturally. From that, as connection, collaboration, and cooperation are all strengthened, more of all of these good things manifest.